The apple is the pomaceous fruit of the apple tree, species Malus domestica in the rose family (Rosaceae). It is one of the most widely cultivated tree fruits, and the most widely known of the many members of genus Malus that are used by humans. The tree originated in Western Asia, where its wild ancestor, the Alma, is still found today. There are more than 7,500 known cultivars of apples, resulting in a range of desired characteristics. Cultivars vary in their yield and the ultimate size of the tree, even when grown on the same rootstock. 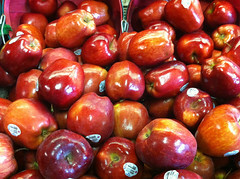 At least 55 million tons of apples were grown worldwide in 2005, with a value of about $10 billion. China produced about 35% of this total. The United States is the second-leading producer, with more than 7.5% of world production. The apple tree was perhaps the earliest tree to be cultivated, and its fruits have been improved through selection over thousands of years. Alexander the Great is credited with finding dwarfed apples in Kazakhstan in Asia in 328 BC. Apples were brought to North America with colonists in the 17th century, and the first apple orchard on the North American continent was said to be near Boston in 1625. Apples appear in many religious traditions, often as a mystical or forbidden fruit. One of the problems identifying apples in religion, mythology and folktales is that the word "apple" was used as a generic term for all fruit, other than berries, but including nuts, as late as the 17th century. For example, the Greek goddess of discord, Eris, became disgruntled after she was excluded from the wedding of Peleus and Thetis. In retaliation, she tossed a golden apple inscribed Καλλίστη (Kalliste, 'For the most beautiful one'), into the wedding party. Three goddesses claimed the apple: Hera, Athena, and Aphrodite. Paris of Troy was appointed to select the recipient. After being bribed by both Hera and Athena, Aphrodite tempted him with the most beautiful woman in the world, Helen of Sparta. He awarded the apple to Aphrodite, thus indirectly causing the Trojan War when Paris took Helen from her husband Menelaus, the king of Sparta. In 2010, an Italian-led consortium announced they had decoded the complete genome of the apple, using the Golden delicious variety. It had about 57,000 genes, the highest number of any plant genome studied to date and more genes than the human genome (about 30,000). This new understanding of the apple genome will help scientists in identifying genes and gene variants that contribute to disease and drought resistance and other desirable characteristics. Understanding the genes behind these characteristics will allow scientists to perform more knowledgeable selective breeding. Decoding the genome also provided proof that Malus sieversii was the wild ancestor of the domestic apple - an issue that had been long-debated in the scientific community. TRIBUNE: Gallipolis Wins Four Bloom Rating!